Pomegranates are touted for their many health benefits, so why not include them in a cocktail by mixing up a pomegranate martini? Pomegranate juice is a little tart on its own, but when you add a few mixers it becomes a delicious cocktail that satisfies both sweet and tangy cravings. For a basic pomegranate martini, combine equal parts pomegranate juice and unflavored vodka in a martini shaker along with splash of simple syrup. Shake the drink with ice until it's cool. Strain it, and serve it in a martini glass. Simple syrup can be purchased or easily made at home. Combine a cup of water and a cup of sugar in a saucepan, and bring the mixture to a boil. Reduce the liquid to a simmer and stir until the sugar is completely dissolved. Let the mixture cool, and then store it in an air-tight container in the refrigerator for up to one month. Substitute gin or white tequila for the vodka. Use triple sec or another orange liqueur instead of simple syrup. Add a splash of sparkling water for a lighter, less potent version. Squeeze a little lemon or lime juice into your cocktail for extra tartness, or try a citrus-infused vodka. For a virgin version, add orange juice and/or seltzer instead of alcohol. 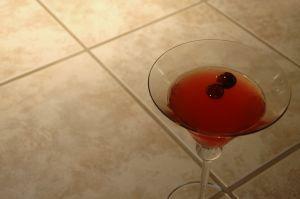 If you want a stronger drink, use pomegranate liqueur instead of, or in addition to, pomegranate juice. Add raspberry sorbet for a festive version of this cocktail, or add ginger syrup for a spicy kick. Skip dessert and make a chocolate pomegranate martini. Simply add a splash of chocolate liqueur, and sprinkle the drink with dark chocolate shavings as garnish. While pomegranate juice isn't cheap, it does provide many health benefits, especially for the heart. It can help prevent heart disease, and it contains 40% of your recommended allowance of vitamin C as well as vitamins A and E. Pomegranate juice is a good source of folic acid and antioxidants. Many people are intimidated by pomegranates, which are a rather quirky fruit. The seeds are encased in an outer membrane and can be a bit unwieldy. However, if you consider yourself a foodie or like a little challenge in the kitchen, try making your own pomegranate juice to use in your cocktail. Cut a pomegranate in half, remove the seeds, and use a juicer to grind them down. An average pomegranate will create about four ounces of juice. Strain out any remaining skin before using the juice to make your cocktail. Now that you have the recipe, give this fruity cocktail a try.